BYOD (Bring Your Own Device) isn’t just a fad, it’s here and its proliferation into almost every industry is accelerating. That’s why it is important to put BYOD policies into place as soon as possible. Forrester Research says the consumer-driven iPad is pouring into the enterprise at breakneck speeds with 81 percent of firms having tablet plans and 250 million tablets expected to be in employees’ hands by 2016. Of course creating a BYOD policy can be quite time consuming and there is a lot to consider. Nevertheless the demand for BYOD is increasing and organizations are being faced with increasing pressure to allow BYOD. 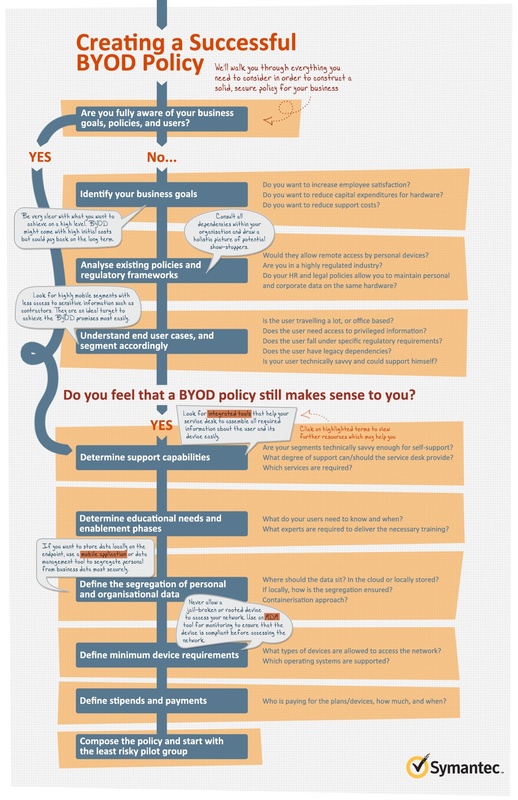 So, to get started with your BYOD implementation, first things first, start with the policy. Symantec consulted the members of more than 65 groups to get a better understanding about how to approach creating an effective BYOD policy. The results are presented in the infographic below to helpfully take IT managers through a flow chart of next steps and considerations. If your organization is considering implementing a BYOD policy, contact us here. We have helped organizations all over the country with their BYOD implementation process. Our goal is to be a resource for you.